We would recommend a deep clean of your carpets every 6-12 months. Not only will they look visually better, smell great and last much longer, but also numerous health benefits that come from this service clean. Need your three piece suite, sofa or chairs cleaned? No need for buying new. We will ensure the very deepest clean with our specialist hot water extraction. View our upholstery cleaning. Persian, Wool, Silk Rugs. We can clean them all, we use PH neutral cleaning solutions with the utmost care. Bring your rug back for it’s best. Enhance their colours and looking their absolute best. See our rug cleaning. Do you need your house lounge and stairs cleaned? Maybe you require an end of tenancy deep clean? Scotchguard stain protection treatments… Yes we do that too. And we don’t just clean carpets. We provide sofa cleaning, freshen up your old rug, tackle stubborn stains, remove fleas from and remove those smelly pet odours from your floors. Homeowner or rental property we will help restore your carpet pile and a whole lot more. Vale Carpet Cleaning Cardiff are expert providers of unrivalled and unparalleled carpet cleaning services to both domestic homes and commercial properties. We have been consistently rated one of the most highly rated carpet cleaners in Cardiff and Wales. Our adherence to high standards and great customer service, we have a number of fantastic 5 star reviews from many trusted websites like Yelp. Child and Pet friendly solutions are used. We don’t use cheap quality cleaning products, those with harsh chemicals or bleaching agents. For added peace of mind, our team of experienced expert upholstery and carpet cleaners are public liability insured and qualified by the IICRC (The Institute of Inspection, Cleaning and Restoration Certification). So what are our prices? When you hire us you can be rest assured that we will be highly competitive vs other local firms in our costs for cleaning. The more rooms and areas you have done then the more cost effective it will be. In most cases will can give a quotation over the phone, via text or email. However in some circumstances we may need to view the property. This is ensures we provide the most accurate and best prices for your clean. As you can appreciate every carpet clean is different. Some can also involve the removal of difficult stains that need specialist cleaning treatment and attention. Hence these types of jobs will take much longer work on and will cost a little bit more. Confident that we offer the very best range of value for money carpet cleaning service around there is a money back guarantee if you’re not completely satisfied. There are numerous benefits associated with a deep wash and cleanse of your carpets. Primarily the appearance and longevity is enhanced. In addition, there are a significant number of associated health advantages. Not only will it help eradicate dust mites, food debris, allergens and pollen, but also any other harmful bacteria that is trapped down within the fibre roots. Even carpets that are regularly vacuumed still are very dirty deep down. After every job we empty the tank from our machinery, the water that comes out most of the time is pitch black and stinking. We have had a number of comments by sufferers of asthma and other allergies that their symptoms have improved simply be having their homes in Cardiff, Wales professionally cleaned at least once a year. Hot water soil extraction method is used, which is also known as ‘steam cleaning’. The hot water under high pressure water flushes out dirt from the very bottom of the floor upwards and up and out of the pile. We believe this is the most thorough type of clean you will ever get, and from the results is regarded as the very best method by rug and upholstery companies and manufactures. Our company technicians use the very best carpet cleaning company machines and products by the brand Prochem and Craftex. No matter what it is you need clean, you can have complete confidence that we will have the solution. It’s time to say goodbye dirt and breathe fresh new life into your carpets. Simply put “we will make your carpets cleaner, healthier and longer lasting”. We are fully trained by the institute of carpet cleaning and restoration, this is an intensive two day course which covers everything from identifying carpet fibres to carpet chemical chemistry. The institute operates not just in Cardiff, but nationally and internationally and highly regarded as a market leader carpet, rug and upholstery cleaning Cardiff but in the entire United Kingdom. In this course things are covered such as analysing the type of carpet fibres, ph levels, overcoming problem stains, the different types of carpet and rugs. The correct company insurances, equipment and so forth. Cheaper products used from the super market are just not adequate to handle wool in particular in addition to leaving a residue they should be fully extracted using a extraction method. In this case we utilise hot water extraction methods. It is no surprise on a weekly basis we are called out to re clean carpets where people have hired a rug doctor. In addition to the IICRC qualification you can also look at the national carpet cleaners association for reputable carpet cleaning companies. Both are great credentials, we as a company opted for the IICRC which covered two days followed by an exam which we passed with flying colours. The team keep up to date with latest trends, products and carpet cleaning news. Where possible we travel to cleaning exhibitions and industry events. Full public liability insurance via our parent company advance cleaning management. Customer service is absolutely paramount. To evidence this ethos we are so confident that you will be pleased with our carpet cleaning services. In the very unlikely event you are not happy about our cleaning service, we will either clean your carpets again or offer a full refund. Whats not to love? It is also very important to be aware that is some rare circumstances very deep rooted stains can appear back once dry. There is no need to panic. This scenario is known as wicking and quite normal with wool carpets where as the stain dries it wicks back up the carpet fibre like a candle, in these type of cases we always will come back and carry out a soil extraction at no extra charge to take care of it and clean it for you. So in summary you can be rest assured that when you deal with Vale Carpet Cleaning you are dealing with the best carpet cleaning service around. Incredible top value for money combined with excellent customer service. 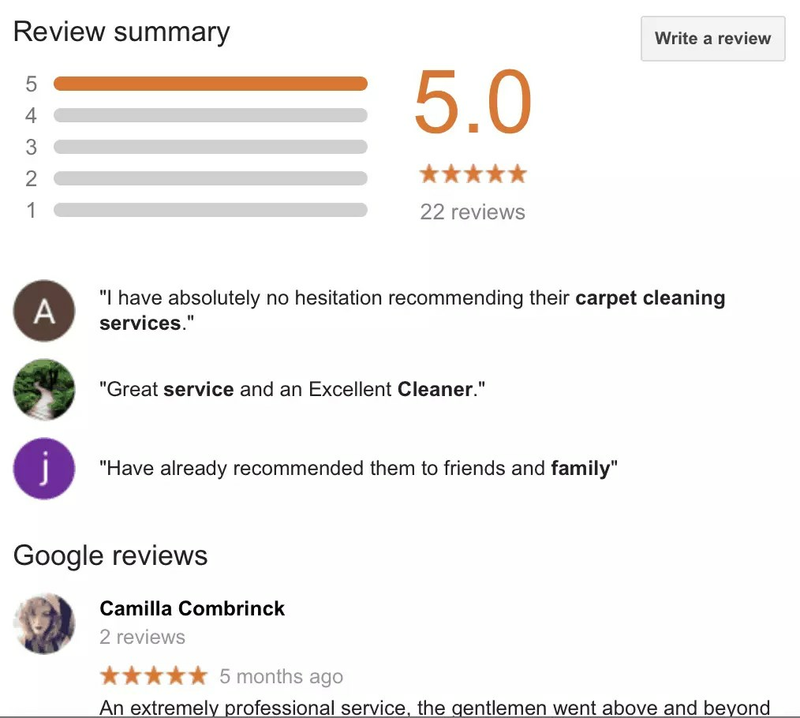 Just take a look at our carpet cleaning reviews and you can see what our customers think. We look forward to working with you. Our Cardiff carpet cleaners have been invested fully not only in training but also the equipment and products that we use on your carpets. We don’t use solutions with bleaching agents, or any of that nasty ‘off the shelf stuff’ cleaning products (yes believe it or not a vast number of companies will still use rug doctors or vanish from the supermarkets, which can damage your carpet). The machines we use are built in the UK and known as ‘portable truck mounts’ the air flex pro has a triple vacuum and 800 psi pump which can tackle and clean even the dirtiest of carpets. 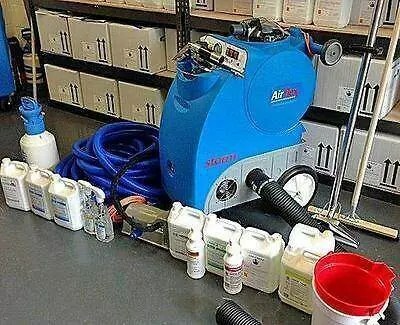 In terms of the carpet cleaning products, the solutions we use to get your carpet clean we opt for the professional brand Prochem, which is highly regarded as being the industry leader and is regularly recommended by many carpet manufactures as the some of the best wool safe clean solutions. Yes believe it or not, their is a science to cleaning carpets. They should be left in a PH neutral state of being cleaned correctly. We use an alkaline pre-spray product coupled with a acidic based rinse solution for the perfect clean. We are regularly contacted by householders who have rented a rug doctor and have called us to come and clean. This is another reason why to hire a professional to clean your carpets. Time you take into account of the cost of hiring the machine and then leaving a deposit and buying the products it wont work out more to get the professionals in to take care of it all for you. Another popular brand is called Craftex. We also recommend these carpet cleaning solutions alongside Prochem. Also things like using water to hot can damage carpets, particularly wool carpets or viscose rug or upholstery. Thats right, things like this which most people don’t think of can be the difference between a great clean and a bad one. PH levels also play a very important factor as stated above if left in an alkali position which can cause discolouration called ‘browning’. Again poor cleaning products can cause damage and require professional restoration to correct. You may find that there a number of companies that offer “to good to be true cleaning pricing” usually they will up-sell upon arrival and add hidden extras. This can also be known in the industry as “bait and switch“. We absolutely don’t do any of that, no sales pitch or selling patter, we are fully transparent in the price we give is the only price you pay and as an added bonus there is no VAT added. With us, the more carpets that you have clean the greater the cost saving value you receive. This is due the equipment taking a while to set up and pack away, doing more rooms, rugs and or upholstery won’t cost much more, hence the value for money aspect. Furthermore we can also provide a stain guard treatment such as scotchgard to help protect your carpets from stains and spills which may happen in the future. If you have pets or young children its definitely advisable to get the added stain protection. Any future spills will sit on the surface for a few hours allowing you to wipe the spill clean without penetrating deep into the carpet fibres. We have over 50 testimonials at reviews, all of which are 5 stars all of south wales and Cardiff. We regularly get feedback such as: “An extremely professional cleaning service, the gentlemen went above and beyond to help us with our end of tenancy carpet cleaning and were very efficient.” Even though we are ‘just cleaners’ we take pride in our work and very proud of these as customer satisfaction is paramount to us, and we always strive to put Cardiff customers first with our clean. Our company provides upholstery, rug and carpet cleaning in Cardiff (including Cardiff suburbs such as; lisvane, llandaff, llanishen, cyncoed, roath, splott, canton, grangetown, Cardiff bay. In addition all the surrounding areas including: Vale of Glamorgan, Barry, Cowbridge, LLantwit Major, Porthcawl, Rhoose, Bridgend, Dinas Powys, Sully, Pontypridd, Rhondda Cynon Taf, Caerphilly, Wenvoe, Penarth, Newport & South Wales. For large commercial premises we will cover all along the M4 corridor.